Cox Conoco in Mancos offers automotive services, outdoor products, and convenience store items all in one place. Save time while shopping or traveling by visiting our store. If your car’s been little unsteady or wavers slightly while making a turn, you may be due for a wheel alignment. Cox Conoco offers on-sight 4 wheel alignments to ensure even tire wear and a smooth ride. 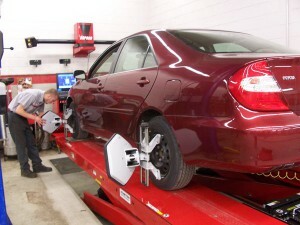 Our mechanics get your car into one of our bays quickly and can complete an alignment service in about 45 minutes. Get the most out of your tires and ensure safe and even wear with Cox Conoco’s tires rotation services. We’ll get you in and out in under an hour after your service begins. Flat or leaking tire? Bring your car in to Cox Conoco. We’ll check the tire pressure, patch and seal any leaks, and straighten wheels as needed. Our associates will let you know if replacing the tire is recommended. Whether you need new brake fluid, one or both set of pads replaced, new lines, or rotors, our Mancos brake services include the repairs you need to stay safe on the road. We work with small cars, sedans, SUVs, and trucks of any make and model. Our oil changes are fast and reasonably priced, with a lubricant applied as needed and a filter change done with each oil change service. Is your car hesitating when shifting or accelerating more slowly than normal? You may need a transmission flush. It’s also a good idea to flush out your transmission as a regular maintenance service to keep it clean and extend the lifespan of your vehicle. Cox Conoco uses BG transmission fluid, one of the highest quality brands in the industry. Our repair services extend to chainsaws as well! Whether it’s the motor or a small part that needs repair, Cox Conoco will get it done. Our experienced mechanics work on several types of small engines, including lawn mowers, tractors, four wheelers, scooters, dirt bikes, and more.